In medicine there is a tendency to return to well forgotten, simple and old means. So, recently for the treatment of diseases of the throat began to recommend efficient. It should be noted that this is almost the only way to cure chronic tonsillitis. Iodinol is an aqueous solution consisting of iodine (0.1 percent), potassium iodide (0.9%) and polyvinyl alcohol. It has a characteristic smell of iodine, foams well and mixed with water. The color of the liquid is dark blue. Able to decompose in the light, as well as in alkaline medium. When applied to the mucous membranes of the slowly cleaves Iodinol molecular iodine is a strong antiseptic and anti-inflammatory substance, and after the disintegration improves metabolism. For sore throat take a glass of warm water and the droplets add it efficient. When the solution becomes dark yellow, you can start gargling. This is the most accurate method of dosage. Some doctors suggest a more simple but nevertheless reliable way: dissolve a spoonful of Iodinol in a glass of warm water and start rinsing. Rinsing the throat yodinolom is possible three times a day, and with strong pain, and more - every four hours. Efficient, is also used to lubricate the throat. In particular, this method is good for treatment of chronic tonsillitis and septic sore throat. To do this, take a rather long stick (can use regular pencil), wrap it in cotton wool to make a cotton turunda. Dip it in efficient, and properly lubricate the tonsils. This procedure is performed when purulent tonsillitis 2-3 times a day, and in the treatment of chronic tonsillitis is enough and one times a day. Assigned efficient when using any of the above methods, for 3-5 days. It should be noted its high efficiency. Often patients say that the pain in the throat passes in 2-3 days. It is also important that the only contraindications to it are gipertireoze is a rare disease associated with an excess of iodine, as well as intolerance to ethanol. The Iodinol (Iodinolum) is a medicine product of the accession of iodine to polyvinyl alcohol. Antiseptic for external use. Indications for use of drugs Iodinol. 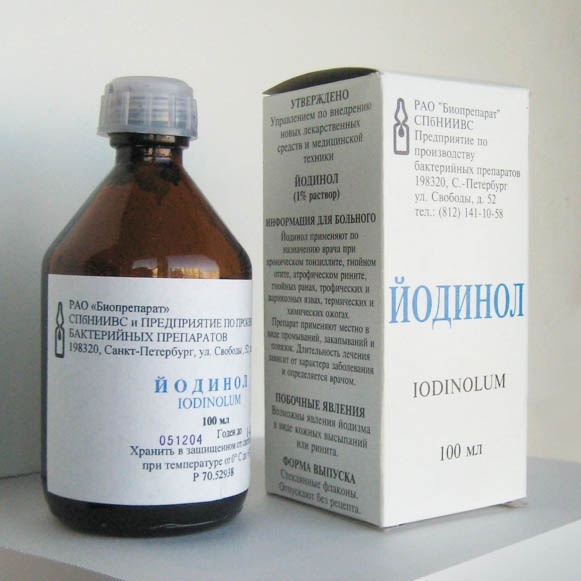 Iodinol is assigned according to the indications: Chronic tonsillitis, purulent otitis, atrophic rhinitis, ozena, chronic periodontitis, purulent wounds and surgical diseases, trophic and varicose ulcers, thermal and chemical burns. Efficient - iodine antiseptic solution, which is sold in pharmacies in bottles of 100 ml of dark glass. The shelf life of the drug and a half years. Efficient, has a bactericidal effect on Escherichia coli, Staphylococcus aureus, fungus, etc. Iodinol is used externally in infectious and inflammatory skin lesions, injuries or wounds. Efficient for local application is recommended in case of burns, purulent surgical diseases, chronic tonsillitis, atrophic rhinitis, purulent otitis, trophic and varicose ulcers. The drug is taken orally for the prevention and treatment of atherosclerosis and tertiary syphilis. 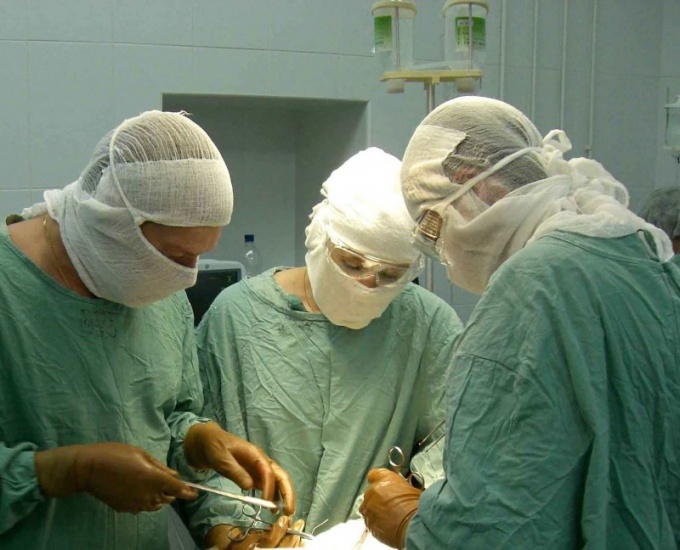 Also efficient need for antiseptic treatment of the surgical field. Iodinol is used locally – for example, when applying gauze wipes, lubrication tonsils or washing. So, chronic tonsillitis spend 4-5 washes with a break of 2-3 days (single dose - 50 ml). Chronic suppurative otitis daily instill 5-8 drops Iodinol. In the treatment of chronic atrophic rhinitis is spraying the pharynx and the nasal cavity 2-3 times a week for 2-3 months. When trophic and varicose ulcers take three times folded gauze soaked yodinolom (before this skin wash with warm water and soap and zinc ointment is applied around the ulcer). Efficient, cannot be used simultaneously with hydrogen peroxide and other disinfectants. The liquid should be dark brown in color. If it is discoloured - means splits the active iodine is reduced and the efficiency of a drug. Avoid falling drug in the eye. It is desirable to use efficient only in a hospital. There are contraindications to receive efficient, inside. Is acne, urticaria, haemorrhagic diathesis, abrasions, chronic pyoderma, pulmonary tuberculosis, nephritis, nephrosis, prostate adenoma, as well as pregnancy and childhood (to 5 years). When applied topically can sometimes cause irritation of the skin, and when it is eaten, allergic reactions, tachycardia, sweating, sleep disturbances, nervousness, diarrhea (more often in patients older than 40 years). In case of overdose observed increased salivation, urticaria, angioedema and rhinitis. In these cases, you need to induce vomiting, lavage of the stomach and consult a doctor.